New Eateries coming to Carmichael’s Public Marketplace! A culinary hub that’s in the works in Carmichael has secured its first two eateries. Mesa Mercado and Ghiotto Gelato have joined the lineup at Milagro Centre, which is billed as “Carmichael’s gathering place.” The retail center, which is patterned on public marketplaces, will transform the space filled by the forlorn Hillside Shopping Center on Fair Oaks Boulevard. Allan Davis said he hopes Milagro Centre will open this summer. He’s overseeing the project with his wife, Nancy Emerson-Davis, the daughter of the late Sacramento developer Joe Benvenuti. What should people expect from the new tenants? Mesa Mercado will cover 4,200 square feet with a restaurant, taco bar and market at Milagro Centre. The concept comes from Ernesto Delgado of Tequila Museo Mayahuel restaurant in downtown Sacramento. Ghiotto Gelato is a dessert restaurant and wine bar, according to its Facebook page. 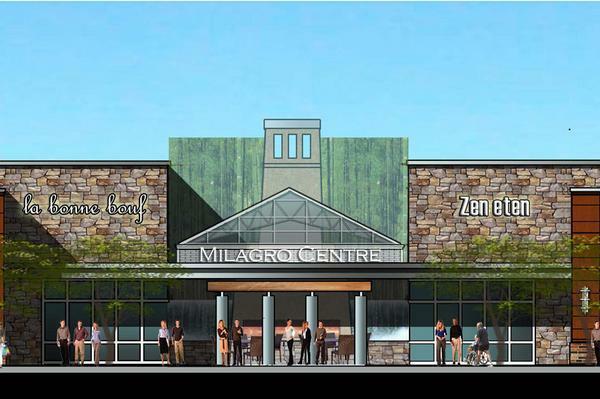 Other potential additions to Milagro Centre include a coffee shop, juice bar and bakery, according to Davis. He hopes to announce more tenants soon. The center will focus on locally owned businesses. Organizers broke ground on the project in 2013. Davis said it will cover about 50,000 square feet. The space includes a 7,000-square-foot event center that’s expected to host demonstrations by chefs, among other things. Davis expects Milagro Centre will ultimately have about 25 vendors. “We’re just anxious to get it open,” he said. What Colors to Paint Your Home this Spring? At the beginning of every year, manufacturers and designers announce a new palette of paint color picks that they feature and highlight throughout the coming months. Just like New Year’s resolutions, the new color schemes give us a chance to rethink and refresh our spaces. So far, the big announcement of the year is from Pantone, the company that leads the design industry with a standardized color matching system that’s used in everything from printing to fabrics to paints. Make the most of them in your own home by thinking like a designer (and we’re not just talking about a fresh coat of paint). Combine and complement your design by bringing color matching in with fabrics, carpet and upholstery. Let’s take a look at the big colors you’ll be seeing and hearing about all through 2015. Marsala: Pantone’s pick for the year, this is the big one. Marsala is a timeless shade of red with distinct brown undertones, and was something of a surprise this year. Much cooler in tone than last year’s Radiant Orchid, Marsala brings quiet sophistication to any space. As an accent, this is a color that may work well with the palette you’ve already established. Think throw pillows, throws and lampshades. If you’re looking for a bit more of a statement, an area rug or papered wall will add warmth and depth to the room without overwhelming it. With crisp white trim, Marsala on the walls is surprising yet subdued. Colorful Coral: Another shade you’ll see and hear a lot about this year is an airy shade of coral. Like Marsala, but lighter in tone, the shade you’ll see is not quite blush and not quite salmon. It brings a little more light and whimsy to your space. On the walls, you’ll find it works in a traditional, almost colonial setting, giving a nod to the British West Indies style. This may not be the color to think of in terms of upholstery this year, but with accents of white or similar delicate but tropical shades, it can help you create a very special and soothing master suite or spa-like bathroom. All About Aqua: As coral is to marsala, this shade of aqua is to its big, bold and blue cousin. With a definite nautical or even tropical feel, this color is perfect with crisp white, whether you’re thinking molding and trim, bedding or upholstery. The contrast is soothing and refreshing at the same time. In a more transitional or contemporary setting, grays and shades of navy provide a grounding background that adds a touch of modern sophistication. Aqua is a great base to work from with all kinds of accessories from light metallic to rich wood tones, and sleek and chic contemporary materials. Big, Bold and Aegean blue: Another brave choice this year is the bold shade of Aegean blue, with its tones of indigo and cornflower. Anything but formal, this rich and warm color is great in transitional or contemporary settings. Crisp and clean with grays and whites, it works well as upholstery for throw pillows—or the whole sofa. While not quite a primary shade, it invites other bright and bold colors as accents. If you’re looking for a fresh start in 2015, this is an adventurous choice that offers lots of flexibility. Soft Sage Green: Finally, we’re looking forward to a soft, sagey green so muted and delicate that it barely registers. If you’re not ready for big, bold change, this soothing color is a great choice in nearly any setting. It works with a very broad spectrum of fabrics and upholstery from leather to linen, and can be a great way to ground some bolder choices in furniture while still offering something a tad more interesting than a basic white. Beautiful with rich wood tones, clean whites and metallics of all finishes, this versatile choice is one that you’ll barely see, but all your guests will comment on. The picks of the year are a great way to start thinking about how you’d like to evolve your space over the coming months. There’s no need to commit to anything right off the bat—grab a few paint chips to pair with your existing fabrics, furniture and accessories and consider what might work best. It’s always worth the time and effort to buy a few pints and try them out in strategic places throughout the house. Check out the current Homes for Sale in Carmichael! Do you know the best Walkable Cities? Get Your Sacramento Home Sold Fast!!! Call or text me today at 916.270.7081 to set up your FREE marketing consultation!